They also offer a monitoring service for developers; which allows them to see daily downloads and revenue, as well as review their app ranking and the ranking of the competition. Within the free monthly reports, readers can compare the top free and paid applications from all of the app stores above listed; as well as view price point comparison. While this report does focus more on the Windows Phone 7 Marketplace, there are still some interesting facts to be seen from BlackBerry App World. This chart indicates the average price of the top 100 paid apps, and all paid apps, from each store. For BlackBerry App world, you can see that the average price for their top 100 paid apps is just under the $2.50 mark (second lowest across the board). 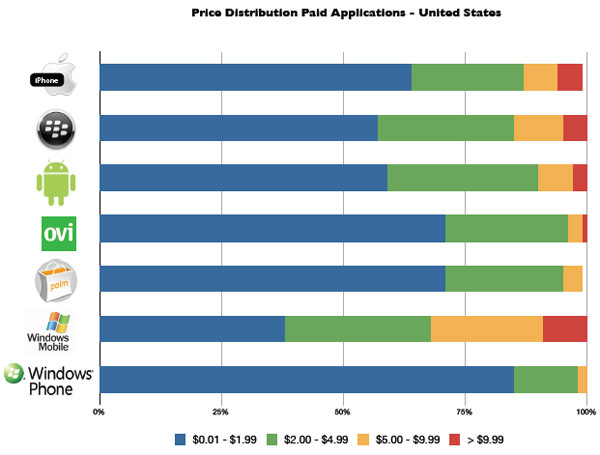 As far as average price for all paid apps go, we are actually smack dab in the middle. 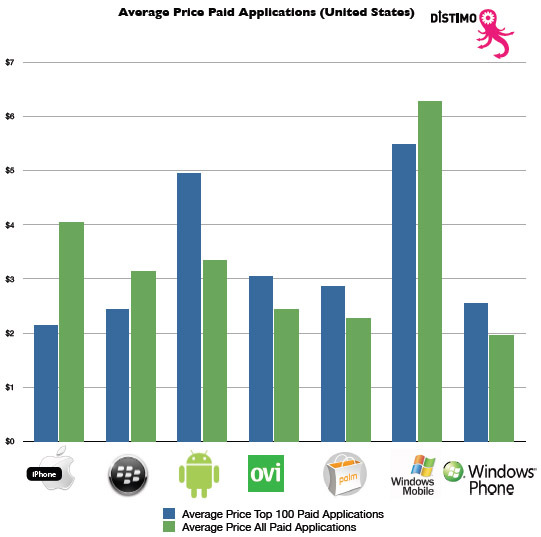 This chart breaks down each application store and compares what percentage of paid applications fall into which price point. 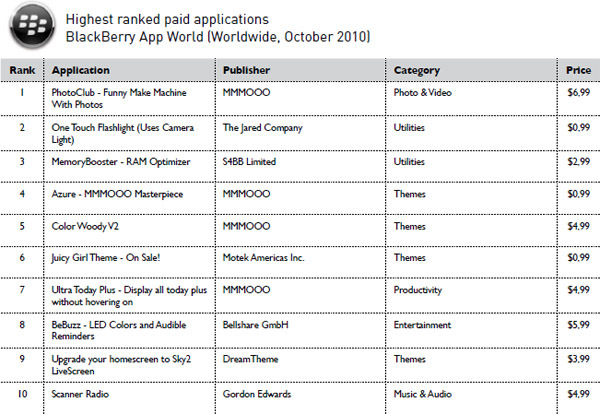 Approximately 56% of the paid apps in BlackBerry App World are priced under $2.00. These two charts indicate the top 10 apps for the entire month of October. 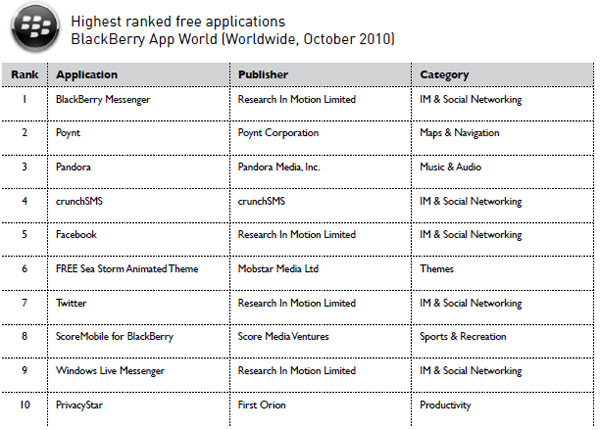 For BlackBerry App World, it was interesting to see that the Top 10s were arguably dominated by free IM/Social Networking Apps and paid Themes. It seemed as through Android users were more about News/Weather apps and other Tools. I thought BlackBerry was supposed to be about productivity! Don’t feel too bad though; iPhone and Windows Phone 7 users were all about paying for games, so we know who’s going to procrastinate more. Note that the stats for Windows Phone 7 were taken from November 1st to November 22nd. I was still surprised to see the types of apps that were the most popular on App World. What does this mean? Are our BlackBerrys so efficient that we just need apps to make them pretty? Or is it the fact that BlackBerry users are waiting for something else? My money is on the fact that everyone is heading to our own CrackBerry App Store instead! Sound off in the comments!